If bourbon must be made with a mashbill that’s over 50% corn, and rye must be made with a mashbill that’s over 50% rye, what do you call a spirit that’s a mixture of the two? Wild Turkey calls it a mistake, but a tasty one. According to Wild Turkey, distillery staff “unwittingly mingled very rare, high-proof rye with perfectly-aged bourbon” (78% 6-year-old bourbon and 22% 4-year-old rye, to be more specific). Given that they named the result “Forgiven,” I guess we can assume the staff that made such a horrible error hasn’t been fired. Described on the bottle as a “blend of and rye straight whiskies” this unique spirit is bottled at 91-proof, notably lower than the traditional 101-proof for which Wild Turkey is known. It sells for $50 per bottle, which has the same shape as Wild Turkey’s Rare Breed offering. The result is a light, orange/gold-colored spirit with a largely straightforward nose that features caramel with some melon and oak. The real fun starts on the palate, where the interplay between bourbon and rye emerges. It’s a tasty combination dominated by resin, caramel, and wood spice, but also with notes of berries, apple, and cinnamon. The finish is long and oily with plenty of wood and dry spice. It’s not what I look for in a rye or or a bourbon, but still I really enjoyed Forgiven. It’s a lively American whiskey that demands your attention: more rye than bourbon (despite the percentages), Forgiven pulls in a complex combination of sweetness, spice, wood, and fruit. Even though the proof isn’t all that high, it demands a full-bodied cigar. I’d particularly lean towards a full-bodied Broadleaf Maduro-wrapped cigar like the Liga Privada No. 9, La Riqueza, or RoMa Craft Cromagnon. If you consider yourself an amateur in the world of bourbon and rye, wait before you pick up a bottle of Forgiven. Instead, try these fine bourbons, or one of these ryes. 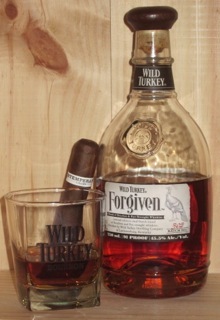 But if you’re moving into bourbon connoisseur stage, you should definitely seek out Wild Turkey Forgiven. I recognize. It’s funny because i just produced a a set of double bed frames for a toddler area. The bed room ended up great.